The quest continues for good value-priced Pinot Noir. This wine is probably the best example yet that I have found of a value-priced Pinot that comes through with high grades fro quality. It is a lovely wine, no doubt about it. A lighter style though, so those of you looking for that value bottle of brawny Pinot, this is not the wine for you. 2004 Henri Prudhon et Fils Bourgogne Les Charmeaux, $16. Translucent deep red rose color. Highly perfumed, some tree bark and leaves, a hint of minty herb after a half hour open, also a hint of aspartame. The nose is the star here, although the high toned dried cranberry and fresh sour cherry palate is very nice too. There is a lingering dried rose petal finish that is really nice. This is a good stand alone wine, although it's much better with food - there is good acidity. At under $20 I would grab a few bottles if I saw them, and drink them this year. I'm lucky because my father in-law likes wine and keeps some good bottles in the house. That means that no matter what else is happening during a visit, there will always be at least that one thing to look forward to - some interesting wine in the evening. Oh yeah, and San Diego is very beautiful, incredible flowers and other vegetation everywhere (even if they have to drain billions of gallons of water from elsewhere to irrigate, but that's another issue). Overall feeling on San Diego at this point: love visiting, even starting to appreciate the odd quirks, like blond surfer dudes munching bagels with smoked salmon spread at Einstein's bagels in the middle of some mall, gray gloomy weather in April, May, and June, face lifts and other body-"improvement" surgery as the norm. I was impressed with the two wine stores I went into. Good selection and decent prices, although a bit higher on some French wines than on the east coast. One store called Meritage had magnums of 1997 Latour and other prized Bordeaux just sitting out in bins like it was Yellowtail. $500 bottles of wine in the bins! They would have been under lock and key in a NYC wine store. The city just seemed safe like that, more civilized. Clean too - no trash on the roads, but that might be because no one actually walks on the roads. 1996 Cristom Pinot Noir Mt Jefferson Cuvee, Willamette Valley - Funky, rotting aromas at first, but blew off to reveal mellow red and black berries, leathery earth. smooth texture, well integrated tannins - almost melted away, prominent earthy underbrush with some red fruit too. None of the primary fatty fruit remaining. Really good wine, and extra impressive to me because '96 was nothing special as a vintage, and this cuvee is not one of Cristom's top wines. A nice example of an Oregon Pinot improving with age, gaining complexity. 2001 Hafner Reserve Chardonnay, Alexander Valley - Great nose of vanilla and tropical fruit, pineapple, citrus too. Full bodied, oaky, but well balanced wine with bright fruit, floral, and buttery oak flavors. Very nice, particularly with dinner. 13.4% alcohol - not too bad. Not a style of wine that excites me but this was a strong example of this style and I can see the appeal. 2002 Michel Colin-Deleger Chassagne Montrachet 1er Cru Les Chenevottes - Such a pronouncedly different style from the Hafner. Much more tense, lighter in the mouth, better balance, not as showy. lighter yellow with a bit of a greenish hue, compared to the bright lemon yellow of the Hafner 01. nose is pure rainwater, still quite reserved. same with the palate, but there are flavors of stone fruit, citrus, and mineral. this needs time to ope up - the last glass over an hour later was really kickin. NV Piper-Heidsieck Champagne Brut - uh uh, not the style of Champs that I like. Thick and without finesse, no mineral quality, very toasty and heavy. 1997 Hafner Cabernet Sauvignon, Alexander Valley - So have you figured it out? Father in-law digs the Hafner. This one was dark purple, with a medium body. Not so impressive overall, as the nose and the palate just don't have all that much to exhibit. Was this an off year in the Alexander valley? Some cassis on the nose, hints of herbs. Unfocused palate of dark fruit and herbs. Next visit I plan on helping the Father in-law translate his writing pad full of scratches and notes to Cellar Tracker. Not sure how this "Tag" thing started, but bloggers have been tagging each other, requiring them to answer in five parts the question - why do you blog? Then to tag further bloggers. 2) And both Jack and Joanne wrote back to me, offering words of encouragement regarding work and life. Joanne said " I hope you find what you love." Well, I'm still looking professionally, and maybe I will get there soon, but I figured 'I love wine, and there aren't many blogs out there devoted to my favorite wines, so why shouldn't I blog?' So I created one. But it sat for weeks without an entry. Who was I to blog about wine? Did I really have that sort of chutzpah, that type of hubris, to assume that what I would write about wine would actually be of any interest to anyone? 3) Then I realized that actually, it is irrelevant to me whether or not anyone wants to read the blog. I mean sure, it's nice to have a soapbox to stand on, but for me, that's really not the point. For me it boils down to this - I love wine, drinking it with my wife and friends, visiting wine regions, tasting everything I can get my hands on. And I approach it the same way I have approached other passions from my past, like chess or poker - I remember everything and I am willing to study, I am interested in the theories of the game, the ground rules, the various strategies and positions. Within them, I enjoy experimenting. Blogging for me became an experiment. Why are there no "pedestrian" blogs writing about Burgundy? Not everyone is A Burghound, nor does everyone have the cellar depth to hang with Bill Nanson at Burgundy Report. What about those of us who can throw a little $ around, but need some guidance? Same for Oregon Pinot, and for the Loire Valley. I decided that I would write the blog that I wanted to read. 4) And then I got my first ever comment, on my third ever post, about a tasting of some New York Wines. The commenter was none other then Lenn of Lenndevours, one of the blogs that I was already regularly reading. Lenn offered to show me around the North Fork of Long Island, something that I have not yet taken him up on, but definitely will, and this offer based on the camaraderie he felt after reading one blog entry? How did he even find that post? Anyway, Lenn's comment really encouraged me to keep writing, and hammered home the idea that I don't have to be a professional to do this, that I can do it for the pure pleasure of drinking and sharing thoughts about wine and food, and the pleasure of reading your thoughts. 5) And that is where it is - blogging is a community of people sharing thoughts about something that is meaningful to them. I don't have a myspace or a facebook or a friendster page. I better brush up on that stuff though before my daughter turns 10, but that's another project. I can't play poker anymore because I have too many responsibilities to put a grand down on the table and fight it out until 3 in the morning. Chess has been with me since I was a little kid, but it's sort of isolating in the study it requires and in the solo nature of the game. A few years ago I had to give it up as I couldn't participate without seeing positions when I shut my eyes to sleep. Now I sometimes think of wine and food pairings and the like when I close my eyes, and I accept that I am a bit obsessive by nature, but at least now I am obsessing about something social, sharing thoughts and reading about other people's experiences. A healthier diversion than many others until I can find my place in the professional world. The quest continues - to identify and share high quality value-priced Pinot. I will admit that I have a serious soft spot for Domaine Jean et Gilles Lafouge, as BrooklynLady and I had such a wonderful visit during our Burgundy trip last November. Soft spot or no, they make very good wine, sometimes excellent wine, and always at reasonable prices. We agreed previously that $25 would be the cutoff for value-priced Pinot, and that is tough my friends, tough. There just isn't that much out there to recommend at that price point. Well, if you can find it (and if you live in the NYC area, go to Chambers Street Wines - they have it), the 2004 Domaine Jean et Gilles Lafouge Auxey-Duresses 1er Cru Les Duresses is a very good wine and it clocks in at exactly $25. I bet it's less out of NYC too, so those of you who do not suffer the weight of NYC pricing - knock yourselves out. Auxey-Duresses is a village in the Cote de Beaune, a neighbor of Meursault, Monthelie, and Saint Aubin. There are only a few 1er Cru vineyards in Auxey-Duresses, Les Duresses and Bas du Duresses are the two at the southern most part of the appellation. A lot of people think Auxey-Duresses is under rated as a Burgundy village, that it is too much in the shadow of the big three (Meursault, Puligny and Chassagne). I am not expert enough to weigh in on that one, but I can say that I have tasted several examples of white and red wines from the village and I like them in general. As always, the producer is more important than the classification of the wine (Bourgogne, 1er Cru, etc). And Lafouge is one of my favorites. The 2005 Lafouge wines are hitting retail now, or very soon, so it might be a good time to grab whatever is left of the 2004 bottles. The new wines might not be as inexpensive - you know, slap a "2005" on the bottle and everyone seems to go nuts. 2004 Domaine Jean et Gilles Lafouge Auxey-Duresses 1er Cru Les Duresses, $25. Crystal clear ruby, very pretty color. High toned aromas of cranberry and sour cherry, some earth. A little cedar on the palate at first, but that dissipates quickly. Flavors of cranberry and sweet red berries, some pine, and a nice acidity, kind of like apple skins. A light-medium bodied wine, this is not in any way muscle-bound, and not an elegant and velvet wine either. It is somewhat in between, and this is probably representative of Auxey-Duresses terroir. That's why the wines don't command the same respect as do those from Pommard or Volnay, two higher profile (for reds) Cote de Beaune appellations. In an unspectacular vintage like 2004, the wines can seem hollow in the mid palate. This wine never felt hollow - Lafouge is too skilled for that, but it doesn't have the substance of Lafouge's 2004 Pommards, for example. It is a very good Pinot in the lighter style, and at $25, it is certainly worth the money. Make sure to enjoy it with food though, the flavors come alive and the acidity works better while eating. BrooklynLady and I have never been big on the restaurant scene. Yeah, we enjoy a good meal out as much as anyone, but we are often frustrated by "good" restaurants that charge an arm and a leg for nothing special food. Some of our favorite places include little Pho joints, a BBQ joint that I hope remains hidden in the obscurity of Greenwood Heights, an amazing ramen counter, and other such places. Now with a baby it's hard to go out to dinner and when we are able to get a babysitter on a Friday or Saturday night, I'm not sure that going out to dinner is best way to spend our time (or our $). But what about during the week when the 'rents come by to see their grand daughter? Isn't there an hour or so to slip out to a local spot? You know, there is less pressure cause it's a Tuesday night. So what are the best places for us to have our all-of-the-sudden neighborhood dinner out on a weeknight? Our most recent attempt to answer that question found us at Flatbush Farm at the intersection of 6th Avenue and Flatbush. The decor is lovely - dark wood and white walls, kind lighting, high ceilings. Seems like they haven't changed anything - they must have appreciated the excellent design work unertaken by Saint Marks Bistro, the previous occupants. We had no reservation on warm Thursday night and we had our choice of tables at 7:30 - a good thing and a bad thing, depending on how you look at it. Service: Certainly pleasant, but they rushed us even though the place was half empty. Good servers should recognize when people want to take their time, and should not return every two minutes to see if we're ready to order. And don't fill the wine glasses, and stop asking if we're finished with those plates. Leave us alone, for goodness sakes! Food: The menu says that all meats are "organic farm fresh without hormones or antibiotics." It also says that local produce and dairy is used as often as possible. These are definitely good things. The menu doesn't take any risks, but offers a nice variety. Vegetarian? You have a couple of nice choices. Meat, fish, fowl - all there. Specials on that warm Thursday evening included a spring pea soup and a duck confit. We started with a "Frisee and crispy shitake salad with blue cheese." I enjoyed this salad very much, although it was not as advertised. The mushrooms were not crispy - just normal, tasty soft mushrooms (all 2 of them). And there was enough blue cheese crumble to make dip for Buffalo Wings. I liked this dish in a "bar-food-salad-that's-bad-for-you, actually" way. BrooklynLady - not impressed. BrooklynLady ordered the French Dip sandwich. We were both in complete yum-land on this thing. Super tender brisket (I think), sliced medium-thick and piled on a good quality piece of baguette, topped with carmelized onions and what they said was Gruyere cheese. I kind of doubt it was Gruyere, but it doesn't matter because the sandwich was delicious. Perfect for a rainy night, great anytime. And the accompanying fries were also top notch, the salad fine too. I went with the duck breast served on French lentils with some kind of citrus sauce. This dish was also very impressive. The duck was done by some one with skill - the skin perfectly crisped and salted, the breast meat pink, savory, and tender. And the green lentils, the baby carrots, turnips, and other vegetables in that light citrus sauce, not buttery or salty...? YUM. I would return to the restaurant just to eat this dish. We did not eat dessert, which did not bother our server because the place was almost full with more folks coming in at about 9:30 when we left. Overall - promising food, worth another try. The bar menu, and the bar itself (next door but connected by an interior passage near the restrooms) are probably an excellent value. I might have to check them out next. Wine/Drinks: A nice wine list with reasonably priced bottles from all over the place. Not thrown together by a disinterested corporate partner, some one cares about the wine list. Languedoc, Loire Valley, and other "less famous" wine regions dominate. You can get a good bottle of wine here for a decent price. The glasses are not as good of a value at a minimum of $9 or $10, but they are interesting - you can get a glass of Wolffer Chardonnay here. That's right. local Long Island Chard by the glass on Flatbush Avenue. Makes sense, right? We went with the brand new 2006 Domaine des Roches Neuves Saumur-Champigny. I LOVED the 2005, and I'm still experimenting, but I think I'm a big fan in general of Roches Neuves. This wine was $34, tough to stomach if you know that you can buy it for $15 in a store once it's released, but that's normal for a restaurant. This wine was excellent. Not as plush and extracted as the 2005, but dark and aromatic, fruity and herbal, excellent with food. Miscellaneous: Hipsters with thick wooden framed glasses on dates, a man with his older father and his young son, a decidely diverse clientele, ethnically speaking, anyway...I liked the vibe in this place. One bit of nastiness - the bathrooms are tucked discreetly in a passageway between the restaurant and it's neighbor, the bar. The one I visited sported a small but rather nasty bit of evidence of recent use. You have to check the bathrooms once an hour if you're gonna charge real $ for dinner. Value: Not great. One salad appetizer (no truffles, no rare heirloom anything), two entrees, one of which was an overgrown sandwich, and a $34 bottle of wine...$91. Not a rip off at all, but certainly not a great value. Come again: I will try eating at the bar before I return to the restaurant. This place might be best for a great burger, tempura onion rings, that kind of thing. Did You See That (Part 2)? Here are a couple of posts from the past month or so that really stand out for me. Take a peek and see if you read them already, if not - worth your perusal. Rusty Gaffney, the Prince of Pinot, writes and publishes a whole newsletter every week! His newsletter is called Pinot File and it is completely and endearingly devoted to Pinot Noir. Pinot from all over the world is discussed and reviewed, but California seems to appear more often than anything else. In the March 27th issue of PinotFile the Prince offers a report on a recent Australian Pinot Noir festival that includes tasting notes on the Domaine Romanee Conti's Grand Cru offerings from the 2004 vintage. Fun to read because I, with all due respect, have no faith whatsoever in "professional" reviews of DRC wines - too many thousands of dollars at stake for objectivity. But the Prince has no financial stake in this at all. He is just absolutely passionate about Pinot. What really intrigued me about this issue is the Oregon tasting (page6). St Innocent makes an appearance, as does Shea, Soter, Domaine Serene, Sineann, and the cultish Sine Qua Non. Interesting to see how his tasting group scored the wines. I don't think this is a blind tasting, but I'm not sure. Prince? Are you out there? Was this a blind tasting? If you have been reading this blog with any regularity you know that I'm a fan of the Wine Doctor. Not a blog, as you cannot post comments, but an amazing online resource. Before deciding whether or not to buy Loire wine, for example, I often check to see if Chris has posted anything about the producer. I have learned about many wines that I now love via this site. Doc is focusing more on Bordeaux this year, but the site is easy to navigate and well archived, so if Bordeaux isn't your thing, you should still check it out. The Doc recently posted notes from a mammoth Champagne tasting. The notes are in two parts: first the non-vintage (NV) wines, then the vintage bubbly. Mostly large houses, not the grower stuff that I've been slowly tasting, but it's good to read about Perrier Jouet too, right? What impresses me most about this review is the attention to detail, the patience and stamina for tasting the goes into this. 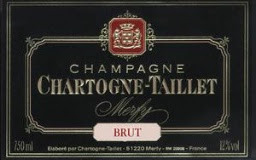 There are many bubblies reviewed here along with notes that really make me feel that I could choose NV champagne wisely. See what you think. 2002 Sylvan Cathiard Vosne Romanee, $25 (secondary market). This was a Deetrane purchase at auction on Wine Commune. Too early to open it, and we knew it, but why not taste a bottle when you get a case at auction? This wine was deep ruby colored, a reserved and tight nose that showed a lot of iron, some underbrush. After a half hour open the fruit makes an appearance, lovely red berries and dark fruit too, but then recedes again, replaced by pine and leaves. This wine is chock full or potential, which is why I bought three of them from Deetrane (tertiary market?!?) to lay down in the cellar for a while. 2003 Sineann Pinot Noir Phelps Creek, $40. What a pleasant surprise this wine was! An Oregon Pinot from cult producer Peter Rosback, but not from the Willamette Valley. This is from Hood River County. I sometimes find Sineann's wines to be too big, to overdo it a little. From a tough hot vintage, this wine is a perfect candidate for overdoing it, but it was great. Pretty garnet color with rich sweet smells of blue fruit and earth. After a half hour open, the aromas really blossomed: distinct mushroom and lavender aromas followed the dark berry fruit. The palate did not live up to the nose in complexity, but was certainly sweet and sappy, with a pleasant earthy finish. I wish I had more of this wine. 2004 Adelsheim Pinot Noir Bryan Creek Vineyard, $48. You know, I'm starting to wonder about Adelsheim. I have been seriously disappointed with their single vineyard wines from the 2004 vintage. Did they change wine makers? Change something else? I will have to call and ask, because the style certainly changed. This wine was clunky and heavy, and not because it's too young. You can sense when a wine is just tight and disjointed, but might unwind nicely. That is not this wine. Too much alcohol heat, too little fruit, nothing really here that comes close to meriting the $48. 2005 Belle Pente Willamette Valley Pinot Gris, $17. Pinot Gris is now the number one white wine coming out of Oregon. There is a lot of great Gris out there and a lot of mediocre wine. This grape, known as Pinot Grigio in Italy, can create crisp and light (and in my opinion, insipid) wine, or as in Alsace, richer more floral, more nuanced wine. Most Oregon Pinot Gris producers veer toward the Alsace style and there are some fantastic wines at really good prices. This is not one of them. Austere to the point of boredom. Sure, the wine has nice citrus notes and it is clean tasting, but there is not enough going on to keep me interested, even as a stand alone sipper. 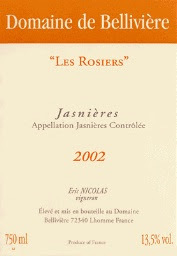 2005 Domaine de Belliviere Jasnieres Les Rosiers, $28. Away from the more famous Loire villages of Vouvray, Chinon, and Sancerre, there lies the Loir river, the masculine counterpart to the Loire. White grape is still the eloquent and majestic Chenin Blanc, appellations are called Coteaux de Loir and Jasnieres. This producer is the one making waves with wines from these appellations, and there is good reason for this. There are four white cuvees each year, an incredible and fascinating rose made from the forgotten grape Pinot D'Aunis, and a red wine that I have never tasted. The most expensive clocks in at under $30, and all of the wines are wonderful with food, clean, well balanced, and expressive. This wine is no exception. Deep gold in color with an interesting nose, new to me I must say, of soy sauce and ginger, with some honey and roses, although that might have been the power of suggestion, as 'Les Rosiers' is the name of the wine, and there are rose bushes bookending the vines. A sweet nectary palate, a big wine, but lots of underlying tension - the wine feels alive on the tongue. It's not going to get any more interesting than this, folks. 2005 Mark Angeli Anjou La Lune, $26. I first read about this producer on the Wine Doctor's site, and then again on Dressner's site. Even just a quick read and you gotta admit - sounds interesting, right? So I finally grabbed a few bottles and popped one the other night with some roast cod. I am in love with this wine - LOVE, I tell ya. So pure, such a lovely nose of white fruit and flowers with a touch of honey. And the palate is a study in tension: acidity, minerals, sweet fruit, delicate floral flavors, all happening at once. There is a full mouth feel, like a dessert wine. And you can tell that this wine has plenty of growing to do in the bottle. If you have the opportunity, you really should spend the $26 (?!?) on a bottle of this wine. I will certainly be buying more myself. 2001 Bodegas Muga Rioja Reserva, price unknown. Deetrane opened this the other night, and he bought it retail, not from some shadowy crook. How do you like that? I enjoy Rioja in general, as long as I can taste wine and not only new American oak. This wine started off pretty woody, but a little time in the glass brought out plenty of juicy black cherries and a bit of meatiness to go along with the vanilla scented oak. Very enjoyable indeed, and would be better with food, I imagine. 1999 Simi Reserve Cabernet Sauvignon Alexander Valley, $45. I enjoyed this tremendously. Lush and dark, very aromatic with cassis and spices, dark fruit too. Smooth round tannins. Took a while to open up, but very nice. This is 93% Cab and 7% Petit Verdot. Really fun to drink this with a flank steak, so unusual in our household. BrooklynLady really liked it too. 2001 Hafner Cabernet Sauvignon Alexander Valley, $32. Brooklynlady's dad turned us on to this wine. It's his house red, essentially. Not available in stores, you have to order it from the winery or at restaurants. After tasting it at pop-in-law's house a few years ago, I ordered a half case and have been slowly making my way through it. This, the third bottle, was the best so far. I probably should have let them all age a little bit. We cracked this at Mike's house at a recent holiday dinner and everyone, including seasoned California Cab fiends, was really impressed. I thought it was very good - creamy dark cassis and plums, very round and smooth. I bet all of you read Eric Asimov's column on Wednesday where he talks about learning about wine at home by having your local wine salesperson pick out a case, taste through it, etc. There are as of this moment, 96 comments on the companion piece in his blog. That's pretty intense. I guess people had a strong reaction to reading about Lyle's and Joy's cases. Probably because they would have arranged their cases differently. 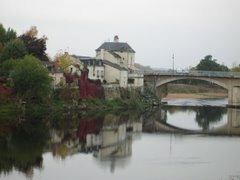 So for all of you who want to poke your toe in the waters of the Loire, here is my case. Not a case from all over the world like Lyle's and Joy's, but Brooklynguy's case of Loire wine, a case that I believe will make anyone who likes wine a Loire lover. All of the wines I included are available as current releases, although production is not as large as in many other wine regions. That means you should go get yours now if you're interested in tasting. Most are from 2005, a wonderful vintage. I tried to include a variety of appellations and styles. My case clocks in at almost $300, so it's not cheap at all. I don't imagine that any one will actually buy the entire case though. Pick what sounds interesting to you, if you don't feel like shelling out 300 clams for a case of wine you've never before tried. One thing I should mention - I did not include red grapes other than Cabernet Franc - no Pinot Noir from Menetou Salon or Sancerre, no Gamay from Anjou...I did that because I think they are interesting, but not unless you develop a taste for Loire wine first. And I think these wines are a great way to develop a taste for Loire wine, if you are among the unlucky ones who have not yet done so. 2005 Domaine de la Pepiere Muscadet Sevre et Maine, $10 (so far, my case is the same as Lyle's). Muscadet is inexpensive, but complex in the hands of a solid producer. Marc Ollivier is a wonderful producer. Best from Sevre et Maine and when aged sur lie (on the lees). Citrus, brine, wonderful with seafood - famous pairing with Oysters. 2005 Thomas-Labaille Sancerre les Monts Damnees, $21 (Our cases diverge here). Sancerre, the darling of wine bars everywhere a few years ago, is made from Sauvignon Blanc. Grassy and floral, fresh fruit, quite different from its white Bordeaux cousin. Clean and pure, usually sees little or no oak. Classic pairing with goat cheese. High end Sancerre can run you $40 a bottle, but great bottles can be had, like this one, for $20 or so. 2005 Chidaine Montlouis sur Loire Clos Habert, $26. Montlouis is across the river from the more well known Vouvray, with whom it shares two important characteristics: 1) the wines are all white and made from Chenin Blanc, and 2) there is a lot of plonk floating around that gives these appellations a bad name. Sad, because the good stuff is enchanting and reasonably priced, a steal when you consider the silly prices of white Burgundy, for example. Chidaine is the real deal, and this cuvee is only slightly off-dry. Crystalline in its purity, great melon and stone fruit, very mineral. This drinks beautifully now with a half hour of air time, and it will age really well. 2005 Domaine du Closel Savennieres La Jalousie, $20. Savennieres is a half hour or 45 minutes by car west of Vouvray. Also the site of tremendous sweet wines such as Chaume, Quarts de Chaume, and Coteaux de Layon, Savennieres is famous for intense, dry, mineral wines. Not as big as Vouvray, but probably more consistent, with several world class producers. This is Closel's approachable young drinking wine from 2005, a classic vintage. You will be hooked on this stuff if your try it. 2005 Foreau Vouvray Demi-Sec Clos Naudin, $33. Many producers say that demi-sec (off dry) is the best expression of Chenin Blanc. I don't know, I love sec (dry) Vouvray too. In fact, the sec version of this wine is just incredible too. This wine is a study in tension - fresh vibrant fruit and acidity, sweet flowers and honey, all pulling on each other, vying for prominence, but compromising beautifully. If you were to buy only one white from this case, buy this one. 2004 Francois Cazin Cour-Cheverny Cuvee Renaissance, $17. Made from the obscure Romorontin grape in a tiny appellation created in order to showcase this grape. Cour-Cheverny whites are a great value in dry white wine, bracing and fresh with great melon and citrus fruit. The grapes used for this wine, though, are allowed to ripen longer and the wine is sweeter, demi-sec at least in my opinion. Delicious as an aperitif, with cheese, or with lighter desserts like pound cake or almond cookies. Will rival far more expensive Riesling if aged properly. And $17 - c'mon. 2005 Domaine des Roches Neuves Saumur Champigny, $15. Thierry Germain's "entry-level" wine. Dark, fragrant, delicious. You can sip this one alone, or enjoy it with food as rich as beef stew. You will want a case of this lying around the house, trust me. 2002 Olga Raffault Chinon Les Picasses, $17. Raffault's top cuvee from one of the big gun vineyards of Chinon. Lighter and more elegant than the Roches Neuves, more funk and earth. This one requires your attention and a plate of roast lamb with herbs. This wine can improve with age for at least a decade too, although I challenge you not to just drink it up. 2002 Catherine et Pierre Breton Bourgueil Les Perrieres, $26. The Bretons are quite famous now, and properly so. They make many wines, some for drinking young, some for cellaring, like this one from the great Perrieres vineyard in Bourgueil. You can drink it now, and you'll find rich dark plums and some red fruit too, an intense nose that also includes some earth and some herbs, plenty of iron and minerals. You will see that the structure will allow for cellaring though. Shouldn't your case have a bottle or two for aging? 2002 Clos Rougeard Les Poyeaux, $55. That's right - $55, for a bottle of red wine from the Loire Valley. Do you have to spend that much to get a great bottle of red? Absolutely not. But if you did spend that much on one bottle, this is the one. Burgundian in its elegance, in the complex intertwining of fruit, floral, and earth characteristics. You will love this if you open it, decant, and drink now. But if you can wait 5 or more years, you will thank yourself. Dessert wines cost a lot, so don't get upset here. Many more resources per usable grape are required. The Loire is the most under-appreciated source for sweet wines, in my opinion. Wines of comparable quality in Bordeaux can cost more than double the price. These wines have an incredible play between sweet honeyed floral fruit and vibrant acidity. They are thick but not heavy. Here is one that you will find on the shelves now. 2003 Huet Vouvray Le Haut Lieu Moelleux 1er Trie, $55. Moelleux (mellow) is the word to look for on Vouvray bottles to know that they are dessert wines. The grapes for this one are picked by hand in individual passes through the Haut Lieu vineyard, selecting only the grapes that are properly ripe, and that are affected with the noble rot. This is the first pass (1er Trie), grapes of the highest quality. 2003 was not so great in general in the Loire, but the sweet wines fared well and don't require as much time to show interesting secondary aroma and flavor characteristics.You can drink this now, this honey-gold nectar, and you will love it. But again, if you give it a few more years in the cellar you will be well rewarded. So that's it, my Loire case for the uninitiated. Enjoy! The folks over at the Wine Cask Blog are hosting this month's edition of Wine Blogging Wednesday, the online tasting event created by Lenn at Lenndevours. The theme this month is regular versus reserve, or is reserve worth the difference? An interesting theme, and one that provides us with a great excuse to open more than one bottle of wine at once on a regular old Tuesday night! I hunted around a bit, trying to find the sister wine to one I already had, or instead looking for a pair of wines from the same vintage, one labeled reserve. In the end I settled on an experiment that interested me from the Loire Valley - Bernard Baudry's 2004 wines. 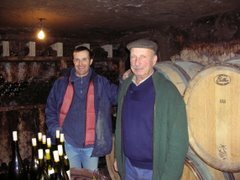 Bernard Baudry and his son Mattieu produce four red wines a year, sometimes a fifth and a sixth, depending on the vintage. Les Granges is the "entry level" wine, meant for drinking young. It comes from young vines and gravelly soil and costs about $14. I have enjoyed this wine very much in recent years, although the 2005, supposedly a great year in the Loire Valley, is not yet drinking well in my opinion. Cuvee Domaine is a serious step up for only a few bucks, about $15. Made from 30-35 year old vines on gravel and clay soil, this wine has more depth, and the structure to improve for several years. The 2002 was just excellent, and the last time I tasted the 2003 I was really impressed. I have one bottle left and I'm trying to hold onto it for a little while. Les Grezeaux is made from 40-60 year old vines, the oldest of the estate, in gravelly soil with clay and limestone. This wine is often aged in wood, supporting its ability to age for some time and adding tannic structure. This wine is a real step up in price at about $25. La Croix Boissee is the top cuvee of the Domaine, made from 25-30 year old vines that are kept to low yields in chalk and clay soils. This wine can improve for many years in the cellar. I tasted a few older vintages when I visited the Domaine and a 10 year old wine tasted young and fresh. This wine costs about $30, sometimes more depending on the vintage. It's too early to pop either the 04 Croix Boissee, so I decided to see how the 2004 Cuvee Domaine (CD) would fare against the 2004 Les Grezeaux (LG), although to be fair, it's probably too soon for this wine also. A 75% step up in price - what would that translate to? CD is less extracted, a more transparent ruby color. It is immediately vegetal on the nose, unpleasantly so. Smells like a fresh green pepper covered in soil. LG is very mineral on the nose, lots of iron and pencil lead. Neither are expressing any fruit aromas, sadly. Both seem tightly wound and maybe a little green. Hopefully some time in the decanter will help. So Deetrane and I bagged them and decanted for over an hour, trying for unbiased notes later on with dinner. Didn't matter in the end, as neither wine improved very much. What happened here? BrooklynLady and I usually love Baudry's wines, but these have little if any fruit character, the tannins are rustic and green, and the palate is dominated by vegetables and varying degrees of mineral. Thanks again to the Wine Cask Blog folks for choosing this theme and for hosting WBW #32. I have a bad habit with Champagne. I rarely buy it because it's expensive and because I don't really know much about it. But sometimes, for a special occasion I buy a bottle and stick it in the fridge - Champs can handle the cold of the fridge longer than still wine. My problem, though, is that I usually find an excuse to open the bottle before the special occasion comes. Since having a baby though, I find that the reverse is true - I cannot seem to open the bottles on the special occasion as planned. I wanted a nice bottle to drink with BrooklynLady when we came home from the hospital with BrooklynBabygirl. Any reasonable person might have told me that we would not feel like, nor would we have time to open Champagne with a 3 day old baby. 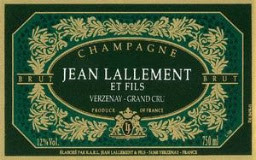 Amy at Prospect Wine Shop recommended the NV Lallement Brut Grand Cru, $40 ($36 at Chambers Street) to me. The bottle sat in the fridge for almost 2 weeks until the in-laws came to town. Special occasion? Yes. The one I had in mind? No. The Champagne? Truly delicious - I would have to say it's my favorite Champagne, although the sample size is admittedly rather small. Honeysuckle and other floral aromas, some chalk too. Vivid fruit palate, green apple, citrus, with a mineral chalk finish. This Champagne is mostly Pinot Noir - 80% I believe. And it's just delicious. I would definitely recommend it as a special bottle. I have not yet tried the Reserve bottle, but that is definitely in my future. I bought a bottle of rose Champagne for Valentines day and hid it in the vegetable crisper in the fridge. BrooklynBabygirl was just a couple weeks old then and things were not so easy on the home front.Valentine's day was, to be diplomatic, not celebrated with the typical glee in our house this year. So it was a nondescript Thursday night later in February, a cold night if I remember correctly, and BrooklynLady and I were hanging out while baby slept, and were reminded that we do, in fact, adore each other. So out with the Champs! NV Chartogne Taillet Brut Rose, $45 (Prospect Wines). We hosted a dinner party the other night, our first since the baby was born. Lots of fun - great company, the food was mostly successful, and I had fun vacillating back and forth on the wine pairings. Adam came with a lovely bottle of Champagne, and this helped me avoid my bad habit, as I was not able to open it while cooking, or to forget it in the fridge. He walked in, we popped it, that was it. And at about $25, the best value of the three to be sure. 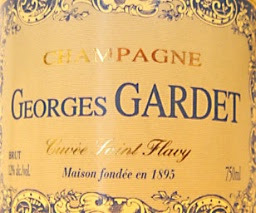 NV Georges Gardet Cuvee Saint Flavy, about $25. Fine bead, thick mousse. Floral aromas, some citrus too. Prominent minerals on the palate, very dry. A lingering floral finish. A very lovely bubbly that I couldn't stop sipping, although I was doing my best to go slow, considering we had about 6 bottles of wine to get through over the course of the evening. I would definitely buy this Champs - best $25 bottle I've tasted. 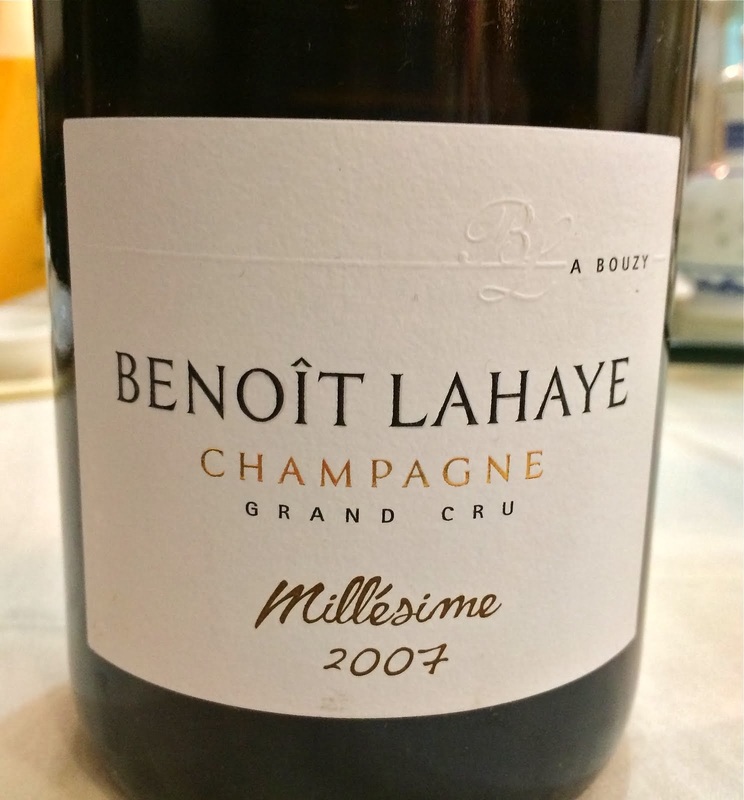 We happened to open a bottle of Prosecco next to the Gardet Champagne that night, and I will tell you that there was an entire world of difference between these wines. The Prosecco was clean and pleasant, but utterly simple next to the Champs. The balance of mineral, floral, and fruit, all in that elegant bubbly package...I could really get used to this. And that would be another bad habit entirely. I am so psyched that the fish people are back at the Grand Army Plaza farmer's market. Their fish is always delicious, the freshest and must flavorful I can get. When I bought fish at the regular store in February, one of their vacation months, it really hammered home what I already knew - fresh fish, preferably locally caught, is the best. So when to my delight they were at the market on Saturday morning I grabbed some bay scallops, some flounder, and a fish head for stock - free with any purchase, and actually the whole fish minus the fillets (See seafood purchased at market and used in this soup, right). I think flounder is an under appreciated fish, probably because of its use in yukky fried fish sandwiches and other fast food. When fresh, flounder is really great, and very versatile. One of my favorite summer brunches is fried flounder, dredged in a mixture of corn meal, a little flour, salt and pepper, and my secret ingredient - pan-toasted whole spices like cumin and coriander, maybe a little crushed dried red chili. The recipe I want to share here though is more of a cool weather dish, perfect for warming the body and the soul. It is so yummy, and it's healthy too. Seafood Soup with Fregole, is what I call it. Imagine a light broth, invitingly pink/orange in color, smelling of the sea. Chunks of fish, maybe some scallops and clams too floating in there. A hunk of good bread too, a glass of white wine or a light chill-able red like a young Chinon or a Cru Beaujolais...well imagine no further (see soup, left). This is surprisingly easy and exceptionally delicious if made with your own stock. It combines fresh seafood and broth with a tomato and dried chili base, and adds some toasted pasta. This dish is probably Sardinian, or southern Italian at least. And making fish stock is the hardest part of this dish. With boxed or canned stock it is still great, but there is no substitute for the real thing, in my opinion. dried red chili flakes - a half teaspoon is warming but mild, increase to taste, but for decency's sake, stop at one and a half teaspoons - you want to taste the other ingredients, don't you?!? Seafood: I used flounder for the fish chunks, and scallops. Use clams, mussels, whatever you want. No oily fish though, stick to white-fleshed fish. Don't be intimidated by making fish stock. If you like to cook, you should try this. Unlike meat and poultry stock, fish stock takes 30 minutes of simmering, an hour total including cleaning the fish. And it is soooooo good. Click here for the recipe I use, from an earlier post. Boil a large pot of water and cook the fregole for 7-10 minutes depending on the texture you want. I go about 7 minutes here because they will also simmer in the soup. Drain and reserve the fregole. Finely mince the garlic and the shallots, cook in olive oil over medium heat. You are sweating these vegetables (getting them to release their moisture), not browning them (see sweating vegetables, left). Add the chili flakes, cook and stir for a few minutes more. Add the tomato paste and stir well, cooking the paste and coating the vegetables with the paste. Peel and coarsely chop the carrot, add it and cook for another minute. I use the carrot purely for the crunchy texture, although it does add a bit of sweetness. You can leave it out, or substitute another crunchy and mildly flavored vegetable. Add the warm fish stock, lower the heat to medium-low, and bring gently to a boil (simmering soup right before fish is added, left). After only 30 seconds boiling, lower heat again so that the soup is just simmering, and add the fish and clams if you are using clams. If you are making the soup in advance, stop before the fish is added - you want to do that right before you serve the soup, same with the fregole I guess. The fish will cook quickly, 2 minutes tops. Add scallops and simmer for about 30 seconds. Add cooked fregole and stir. Ladle soup into bowls and top with finely chopped flat leaf parsley stems (beautiful smell, crunchy texture). I hope you try and enjoy this soup before the cold weather disappears.